There are plenty of firearm manufacturers that claim to have produced “The Gun that Won the West.” And as long as there are Old West devotees, there will be a debate going on somewhere about which gun actually should hold that coveted title. But the truth is that there was no single firearm that officially tamed the western frontier any more than there was just one lawman (sorry Wyatt!) that established law and order during those tumultuous times. The six-round .36 caliber 1851 Colt Navy Revolver. 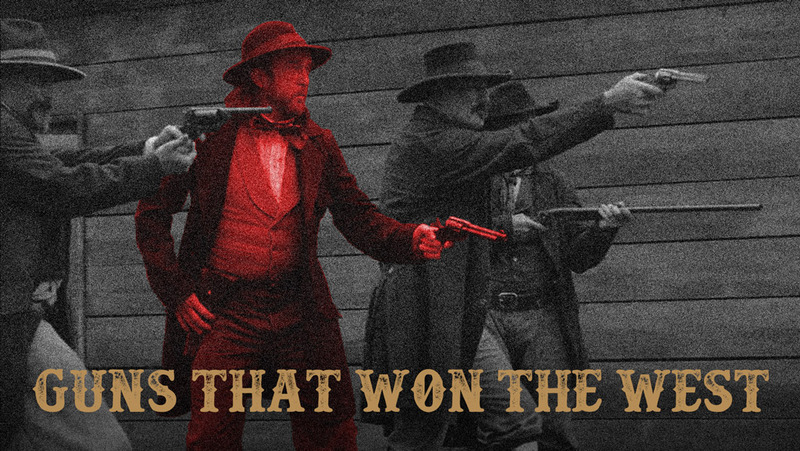 These handsome cap-and-ball six-guns were among the most popular in the Old West. Named for the Republic of Texas Navy, over 200,000 were manufactured between 1850 and 1873. Their reputation for smooth handling and perfect balance made these .36 caliber revolvers popular with some of the famous (and infamous) characters of that era. Among those who preferred the “Navy” were Col. Robert E. Lee, while serving with the 2nd U.S. Cavalry during the 1850s; Confederate Gen. Nathan Bedford Forrest; outlaw John Wesley Hardin; gambler John Henry “Doc” Holliday; and James Butler “Wild Bill” Hickok. The revolver was used by the Union army, while the Confederate army reportedly made copies of it and handed them out to their troops during the Civil War. 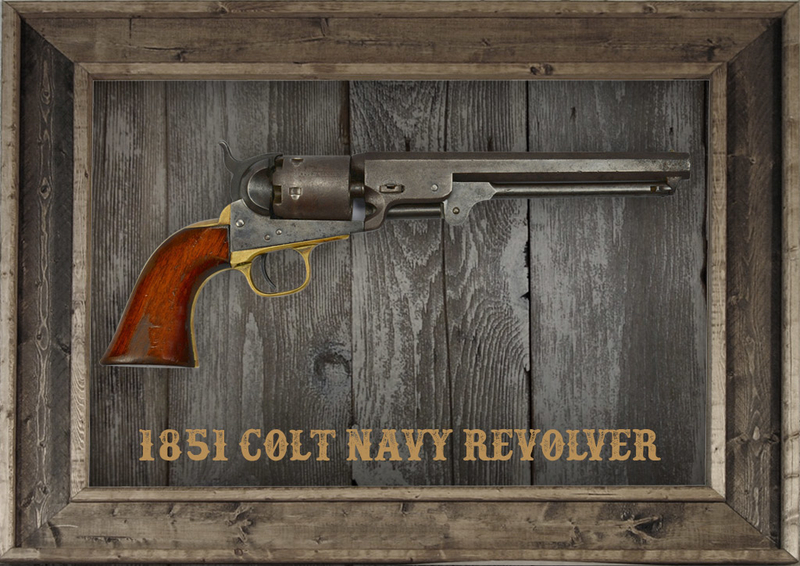 By the 1870s, the Colt Navy Revolver was being converted to take .38 caliber metallic cartridges, but for many years it had been one of the most popular handguns in the West and continued to be used years after modern cartridge revolvers were introduced. 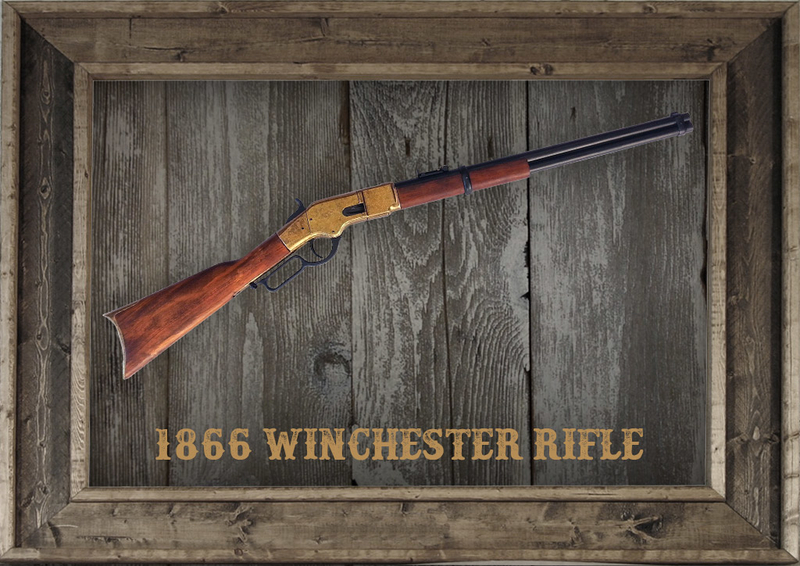 The 1866 Winchester “Yellow Boy” Rifle. Known for its tough construction, manufacturing of the Model 1866 started in Bridgeport, Connecticut in 1867, and between then and 1898, more than 170,000 of these .44 caliber lever-action “repeating rifles” were produced. Improvements to the 1866 included a spring-closed loading port on the right-hand side of the frame, directly at the rear of the magazine tube (previous models had loaded from the magazine’s muzzle end), and this gave rise to the first reliable lever-action repeating rifle, the Winchester, Model 1866. Dubbed the “Yellowboy” because of its unique brass receiver, the 1866 remained popular, in both carbine and full-rifle form, even after centerfire ammunition had eclipsed the rifle’s rimfire type. The rifle was favored by the infamous 1890s outlaw Bill Doolin; Sioux (Lakota) medicine man Sitting Bull; 7th U.S. Cavalry scout Bloody Knife; and California Sheriff Harry Morse. Even the Ottoman Empire appreciated the advantages of the repeater, having purchased over five thousand of them to be used against the Russians. The large-bore single-shot 1874 Sharps Rifle. 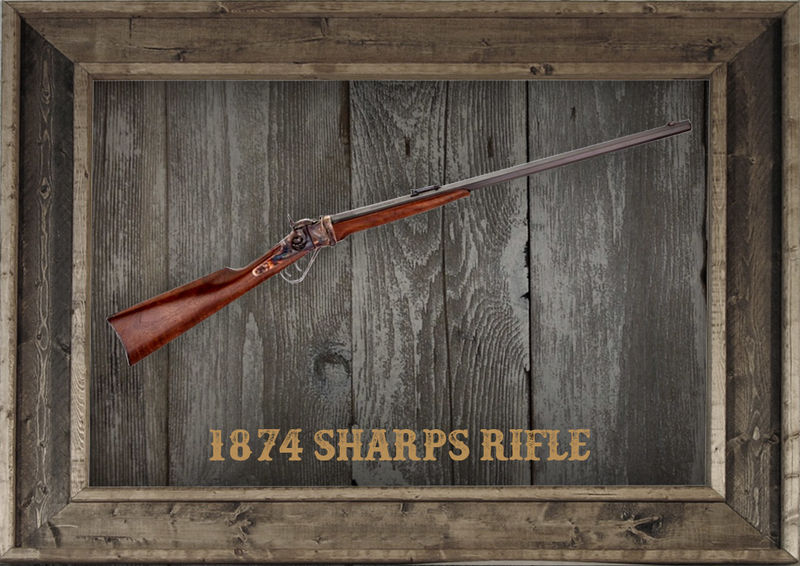 Best known as a sporting rifle, the 1874 Sharps was manufactured from 1871 until 1881 with over 12,000 of the various models being produced from scratch. The rest were made from altered Civil War percussion carbines purchased by the Sharps factory. A favorite among buffalo hunters, the 1874 was offered in such potent big-game loads as .44-77, .45-70, .50-90 and .50-110. The basic Sharps cartridge was made up of three parts: the powder, the bullet, and the case. What set it apart from the traditional Winchester or Colt cartridges was that those components could be varied in size and combined to create a unique caliber cartridge. Among the rifle’s noteworthy proponents were U.S. Marshal Bill Tilghman, during his buffalo-hunting days, and Martha “Calamity Jane” Canary. Legend has it that hunter Billy Dixon used a .50-90 Sharps to fell an Indian from over 1500 yards at the Battle of Adobe Walls in June of 1874. Colt’s .44 caliber Dragoon Revolver. The Dragoon was produced as an answer to the various issues that were encountered with Colt’s Walker revolvers, namely exploding cylinders and its propensity for dropping the loading lever upon discharge, which could lock up the revolver action during combat. The Dragoon was also several ounces lighter than the Walker, making it more useful out of the saddle. Over 21,000 of Colt’s first, second and third models were made between 1848 and 1860, and these formidable “horse pistols” became the favorites of both Western horse soldiers and civilians. The .44-caliber Colt Dragoons were issued to the U.S. Army’s Mounted Rifle troops, and they carried them in pommel holsters on their saddles. The Dragoon’s famous users included Union general George B McClellan; California bandit Joaquin Murrieta Carrillo; and “Wild Bill” Hickok. 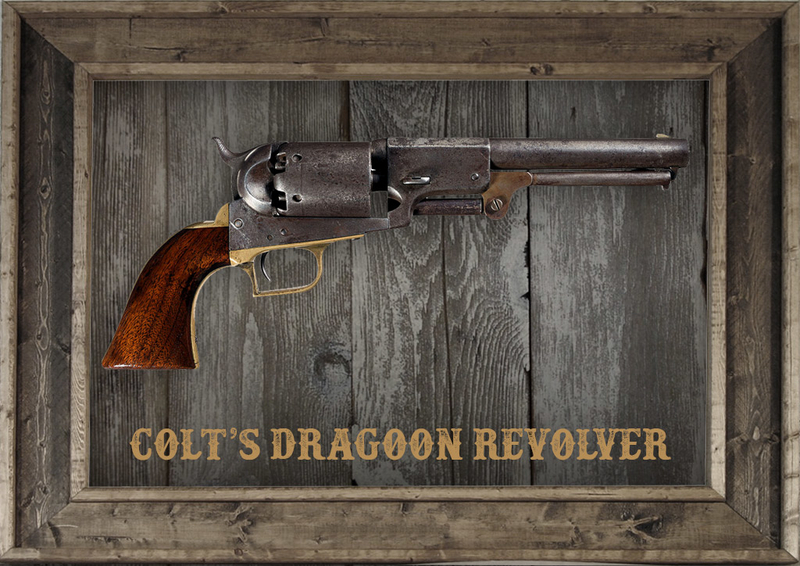 Hickok was believed to have carried the Dragoon, although it is commonly accepted that he used a Colt Navy in his street duel with “Little Dave” Tutt. 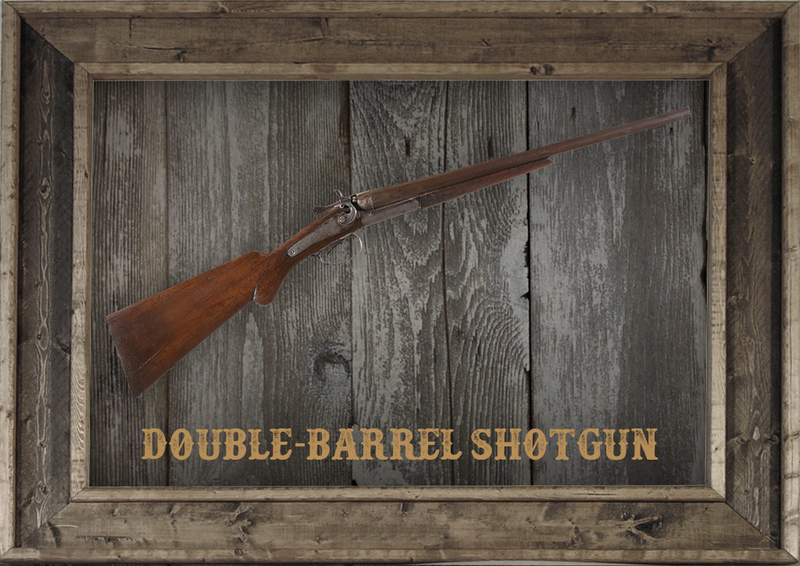 The double-barrel shotgun was a game-changer int he old west. Rifles and six-shooters typically are the firearms credited with winning the West, but one of the most economical and reliable of them all was the double-barreled shotgun. Everyone from cash-strapped settlers to lawmen, soldiers, Native Americans, hunters, and stagecoach operators appreciated the value of the twin-barrel. Twitter and other social media icons below. The more we all know, the better organized and stronger the shooting and hunting community will be. Stay in touch with Widener's, be the first to know about new articles, products, and more.